There's nothing more frustrating than blowing the high of a great workout by wolfing down a carb-laden, gut busting meal. We've all been there—lack of planning and the availability of tempting, easy-to-obtain junk food can inevitably lead to that sinking feeling that you've just consumed three times as many calories as you burned off! And, if like me, you don't cook much—because of lack of knowledge, skill, or affinity—you can find yourself in this situation all too often. So it was with both great hope and trepidation that I decided to try some recipes from the Health.com recipe collection. Hope, because I'd like to take more control over what I eat, and trepidation, because I don't know how to cook! What's more, I'm not even sure I like cooking. Could I really do this??? I decided to take baby steps by selecting a recipe that looked delicious, healthy, and idiot-proof. 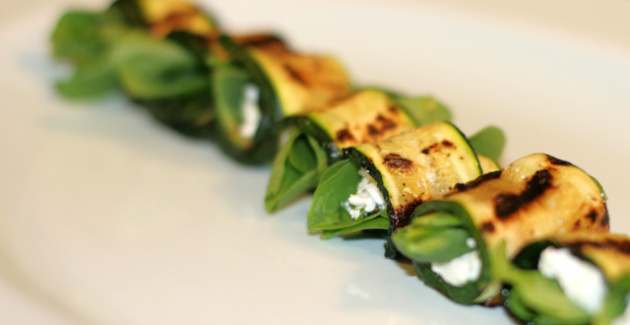 After perusing the offerings, one struck my fancy: Grilled Zucchini Roll-Ups with Herbs and Cheese, from 26 Quick and Tasty Zucchini Recipes. At only 80 calories per serving, and with a bit of protein and fiber, this recipe seemed like just the thing. Besides, it looked absolutely scrumptious--motivation enough to get started. Shopping was a breeze as there are only a few ingredients. Prep, too, was no problem. Cut up some zucchini, brush it with olive oil, and throw it in a pre-heated pan—a cinch. Just a few minutes more, and I had prepared the cheese. I was ready to start rolling. And you know what? I was actually having fun! Well, with a full belly and sated taste buds, I am happy to report that with this recipe at least, my hopes were fulfilled and my fears unfounded. The roll-ups were easy to make, healthy, super-delicious—salty, tangy, creamy, fresh, and tender—and satisfying. Really, you could eat them all on their own, as I did, but I'm sure they'd go great with a main dish or as a party appetizer (oohs and aahs guaranteed). Confidence bolstered, I'm ready for the next recipe! If you decide to try this zucchini recipe, we'd love to know how it turned out. Just leave a comment below or on the recipe page.